The son of Nigeria's former President Olusegun Obasanjo has been shot and wounded in a battle with militant Islamists, the ex-leader's aide says. 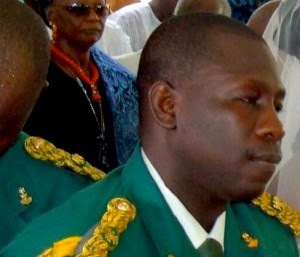 Lt Col Adeboye Obasanjo was injured as the army fought to recapture the north-eastern town of Michika from Boko Haram, Muhammad Keffi told the BBC. "Scores of insurgents" were also killed in the battle, the military said. Last month, Boko Haram declared an Islamic state in areas it controls in north-eastern Nigeria. Experts raised concerns that Nigeria, Africa's most populous country, could break up in a way similar to Iraq and Syria where the militant group Islamic State (IS) has declared a caliphate. Thousands of people are fleeing their homes in Mubi, the second largest city and commercial hub of north-eastern Adamawa state, amid fears that it could be Boko Haram's next target, reports the BBC's Bashir Sa'ad Abdullahi from the capital, Abuja. Boko Haram insurgents have over-run Michika and Bazza, two towns close to Mubi, in recent days, he says. The attack on a platoon headed by Col Obasanjo coincided with a ferocious air assault on the militants, Nigeria's privately owned This Day newspaper reports. Col Obasanjo was in a stable condition in hospital, Mr Keffi told the BBC's Hausa service. His front-line role showed the family's commitment to "one Nigeria", Mr Keffi said. A total of two officers and three soldiers were wounded in the battle, the military said. Olusegun Obasanjo fought in Nigeria's 1967-1970 civil war, when the military put down a rebellion to create the breakaway state of Biafra in the south-east. A former military ruler in the late 1970s, he won two elections when Nigeria returned to multi-party democracy in 1999. In May, he said President Goodluck Jonathan was "overwhelmed" by the security situation in the north-east and he should not run for another term in elections due next year. Boko Haram's five-year insurgency is seen as the biggest threat to Nigeria's territorial integrity since the 1967-70 conflict, analysts say. The group has changed tactics in recent months, holding on to towns in the north-east, where most people are Muslims, rather than carrying out hit-and-run attacks.